The temperatures are rising and summer is almost here! If you have school-aged children, you may be wondering how you’re going to fill those long summer days once the final bell rings. Or maybe you want to check off some sites you’ve been meaning to visit around town. 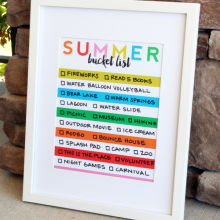 This free summer bucket list printable can help you make the most of your summer days. 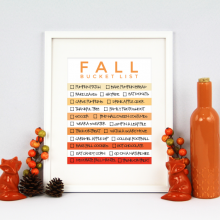 You can either write your list directly on the printable, or have it printed at a photo lab and place it in a frame behind glass. You can write with a permanent or wet erase marker directly on the glass and wipe it off with a wet cloth when you’re ready to make a new list. Thanks so much for this! I am going to do a summer bucket list post but this is a great idea to do to remind yourself to stop and do some of the things you promised yourself! You’re welcome, Stacy! It’s always good to have reminders to hold you accountable, even if the tasks are fun.